Warhammer 40,000 - The Gathering Storm Fall of Cadia introduces some pretty amazing models to the Imperial Soup. Any of these models can be used as an HQ Choice in any imperial detachment. It's pretty clever as it pushes the idea that imperial forces work together and should be considered a single force on the table top more often than not. With a new edition on the horizon it's likely that these models have some hints at what we may see, I'm not big into theorizing what the changes may come in a new edition I just hope that rules for the models I own remain current or are updated quickly to the new edition. Enough rambling about what may come to pass. It's time to focus on the here and now. 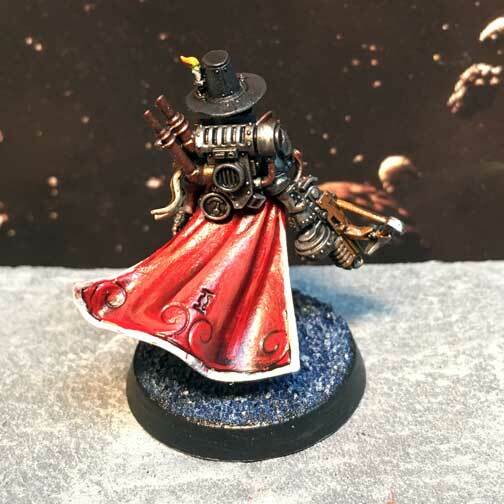 The first model in this batch is Bellsarius Cawl a Mechanicum priest who plays an important role in the story as it advances. This is a plastic kit that is fairly complicated toput together compared to the standard squad kits. You can really only assemble it one way so there's none of the possibility that you'd usually get in a GW kit. As a special character that's forgivable (especially considering the old metal and finecast sculpts). Paint on this one is pretty straightforward I put down a gunmetal metallic, aged bronze and mephiston red before doing a wash of earthshade over the model. I then followed that up with a clean up layer that acts as the first highlight. I followed this up with a coat of wild rider red, sterling silver and pure gold. The end result is a pretty striking figure that looks nice on the table. Saint Celestine and her two flying canonesses were fun to put together. It's surprising how strong the bond is between the scrolls and the plastic base is when you use plastic cement. These are also part of the ongoing Inquisition/Grey Knight force I've been working on over that last year or so. 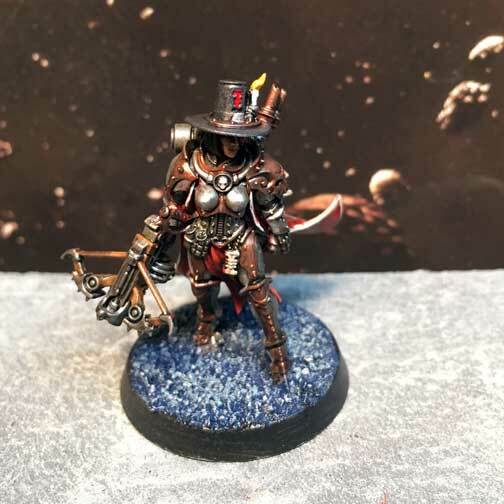 The final model in the box is Inquisitor Greyfax. This is a pretty straightforward model that has similarities to the previous models that were part of the Witchunters range. The pilgrim hat and specialized power armor make this one of my favorite models in this set.